PORTLAND -- Work on the navigation locks on Columbia and Snake River dams is on schedule and nearing completion. 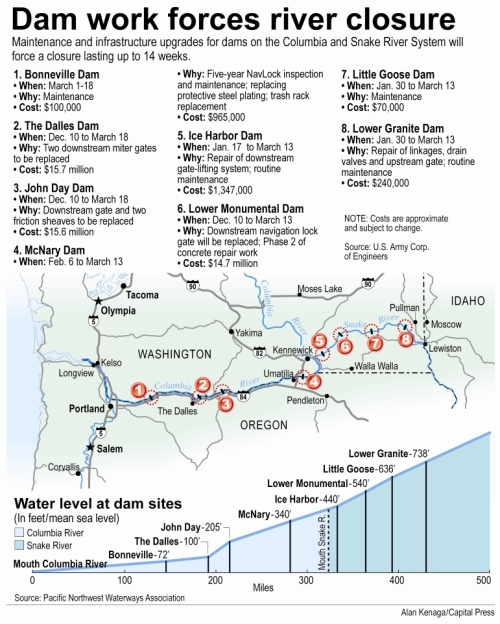 Hal Thomas, spokesman for the Walla Walla District of the U.S. Army Corps of Engineers, said Tuesday the locks at Lower Monumental Dam will reopen at 5 p.m. March 15. McNary Dam, which is having a five-year navigation lock inspection, will reopen at 5 p.m. March 17. Thomas said the dates were changed to bring the return to service in line with the dates at John Day and The Dalles dams. Mark Dasso, John Day Dam gate replacement project manager, said machinery, motors and gears all have been installed. The new lock gate is operational, he said, but testing will take another couple of weeks. Scott Clemans, spokesman for the Portland District of the U.S. Army Corps of Engineers, said the second gate leaf at The Dalles Dam should be installed this week. "Once the gate's in position," he said, "the contractor will be tensioning and positioning. We're still on track to complete the work by March 23." The locks at Bonneville Dam, he added, were placed out of service Tuesday, but will reopen March 18.